The only method of attaining a comprehensive understanding of embryological processes is through the study and comparison of development in various animals, and the chick is one of the most satisfactory animals on which embryological laboratory work may be based. The traditional strength of chicks embryos for studying development is that they are easily manipulated, and this character of the chicken has led to some major discoveries in embryological science. Malaria a febrile illness spread through mosquito continues to be one of the world's leading public health problems including India. In India, malaria imposes an incredible socioeconomic burden on humankind and with six other diseases such as diarrhea, HIV/AIDS, tuberculosis, measles, hepatitis B, and pneumonia are present 85% of global infectious disease burden. In the southeast Asian locality of the WHO, out of 1.4 billion individuals living in 11 countries, approximately 1.2 billion individuals are presented to the danger of malaria and majority of whom live in India. India reports approximately two million cases and 1000 deaths attributable to malaria yearly. α/β arteether is the concentrate of artemisia plant found in China also called Qinghaosu. It has the most rapid action of all current drugs against chloroquine-resistant malaria and Plasmodium falciparum. Eggs of Gallus domesticus (white leghorn chicken), candling box, antimalarial drug α/β arteether, disposable tuberculin syringes, distil water, incubator with humidifier, measuring tape, electronic weighing machine, Vernier caliper, and magnifying glass. Egg's having air cell without any blood clot. Eggs having a blood clot in air cell. The present study was designed to assess the effects of α/β arteether, an antimalarial drug on developing chick embryo in 300 eggs of white leghorn chicken. The study was conducted in the Department of Anatomy, Santosh Medical College, Santosh Nagar, Ghaziabad U. P. in association with the Department of Anatomy, Gold Field Institute of Medical Sciences and Research, Chhainsa, Ballabgarh, Faridabad, Haryana. The eggs were obtained from Metro Feeds, Agro Products, Village Dabua, DabuaPali road, Faridabad. The method was adopted as adopted by Natekar, Singroha et al. Thongphanich and Roongruangchai  and Hussein et al. The eggs were candled to exclude defective ones and to mark outline the exact location of air cell with a pencil. For this purpose, a specially made wooden box was procured. This box had a connection for an electric bulb and was painted black from inside. The slots for the chicken eggs made on the top. The weight of selected eggs was found between 33.30 g to 48.15 g (average 40 g). Before start of the study, 10 fertilized eggs of white leghorn chicken were developed in an incubator without normal saline or distilled water or any drug. On the 20th day of incubation eggs was sacrificed, and chick embryos were obtained. Their weight by electronic machine and CR length by digital Vernier's calipers were measured. The minimum weight of embryo 17.98 g, maximum weight 27.98 g, and minimum crown-rump length 4.90 cm. Maximum crown-rump length 6.70 cm were noted. The weight and crown-rump length of embryos same and between the minimum and maximum measurement were considered as normal [Table 1]. The selected eggs were thoroughly washed with soap water solution and put in an incubator with their broad end up where chorioallantoic membrane is situated. The temperature and humidity inside the incubator were maintained at 38°C and 80%, respectively, with no additional CO2 or O2. The eggs were tilted two times a day. On the 5th day of incubation, eggs were removed from the incubator and candled again before administration of the drug. 3 mg/kg of body weight by intramuscular route for 3 consecutive days (children). Antimalarial drug α/β arteether used in this study is available as an ingredient in commercial injection E-Mal product of Themis Medicare. Injection E-Mal contains α/β arteether as an active ingredient in the strength of 150 mg in 2 ml solution. 1 ml of solution A contains = 75 mg of drug. 1 ml of solution B contains = 7.5 mg of drug. 1 ml of solution C contains = 0.75 mg of drug. Step. 5 1 ml of solution D diluted with 9 ml of distilled water to get 10 ml of solution E.
1 ml of solution E contains = 0.075 mg of drug. Step. 6 1 ml of solution E diluted with 9 ml of distilled water to get 10 ml of solution F.
1 ml of solution F contains = 0.0075 mg of drug. 7 units contains = 0.00039 × 7/2 = 0.00136 mg. of drug. Then, seven groups having 10 eggs each on the 5th day of incubation solution F was injected by insulin syringe in the dose of 1unit, 2 units, 3 units, 4 units, 5 units, 6 units, and 7 units. The 8th group also having 10 eggs was developed without any solution. The toxicity of the drug was estimated on the bases of the hatchability and development of chicks. At the dose of 0.00136 mg (7 units), chick were failed to hatch and the rate of mortality was 90% in contrast with smaller doses 2 units, 3 units. 4 units, 5 units and 6 units the survival rate was 50% to 70%. However, with still smaller dose 1 unit no apparent abnormality was detected. From the above study, it was proved that dose of 7 units (0.00136 mg) of the solution F is lethal dose (LD (50)) for chick embryo hence 5 doses between LD (50) (7 units = 0.00136 mg) and minimum dose (1 unit = 0.000195 mg) 2 units (0.00039 mg), 3 units (0.000585 mg), 4 units (0.00078 mg), 5 units (0.00097 mg), and 6 units (0.00117 mg) were selected for assessment. Eggs were divided into five experimental groups A, B, C, D, E having 30 eggs each and five control group a, b, c, d, e for each test group, respectively, having 30 eggs each. Experimental groups A, B, C, D and E were exposed to α/β arteether with dose of 2 units (0.00039 mg), 3 units (0.000585 mg), 4 units (0.00078 mg), 5 units (0.00097 mg), and 6 units (0.00117 mg) and control groups were treated with the same volume of normal saline. The solution was taken in an insulin syringe. The broad end of eggs was wiped with sterile gauze pad moistened with 70% isopropyl alcohol solution. A hole was made in egg shells in the center of the surface over the air cell with a lancet. It was taken care not to damage the shell membranes with the point of the drill. The needle of the insulin syringe filled with the injectable solution was inserted horizontally into the air cell, and the solution was injected. The needle of the syringe was sterilized after wiping with sterile 70% isopropyl alcohol swab between each injection. The hole of the shell was sealed with candle melted wax immediately after injection. After the injection sealed eggs were kept again into an incubator at 38°C and 70% to 80% humidity and tilted two times a day. On the 20th day of incubation, eggs were removed from the incubator. The eggshells were broken, and the embryos were collected. 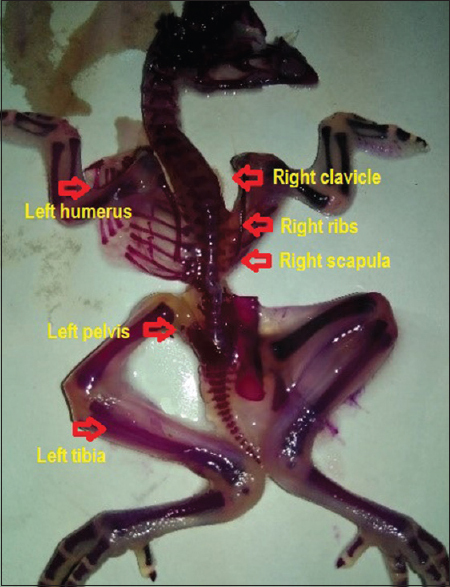 Twentieth day old chick embryos were washed with clean tap water and eviscerated and processed through cartilage and bone double staining method described by McLeod  with little modifications. The embryos were fixed in absolute ethyl alcohol for 7 days. After fixation, embryos were stained for 4 days in a solution prepared by: (a) 1 volume of 0.1% Alizarin-red-s in absolute ethyl alcohol, (b) 1 volume of glacial acetic acid, and (c) 1 volume of absolute ethyl alcohol. For proper and uniform staining, 100 ml solution was used for each skeleton in a separate jar to avoid overlapping. After staining, the embryos were washed with tap water and placed in 2% KOH solution for 48 h for maceration. Macerated stained embryos were passed up through the increasing concentration of glycerin as 20%, 40%, 60%, 80%, and then ultimately stored in pure glycerin with some thymol crystals to avoid mold proliferation. Photographs were taken in photographic laboratory of the department. 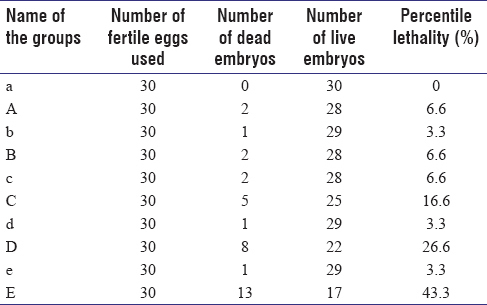 A number of dead and alive embryos were noted and percentage of lethal effects given in [Table 2] and [Figure 1], [Figure 2], [Figure 3]. Number of chick embryos with abnormal weight and crown rump length given in [Table 3]. 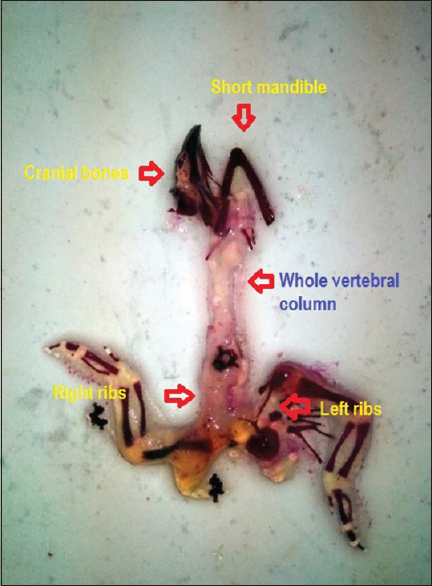 Morphological and skeletal abnormalities were noted, analyzed and compared with control groups with necked eyes and magnifying glass. 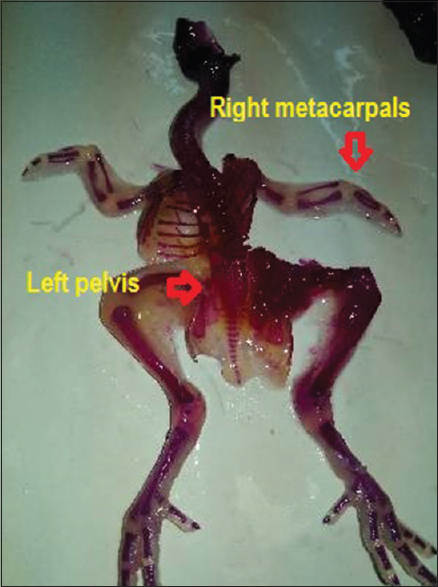 No morphological malformation was observed in all control groups and experimental Groups A and B. 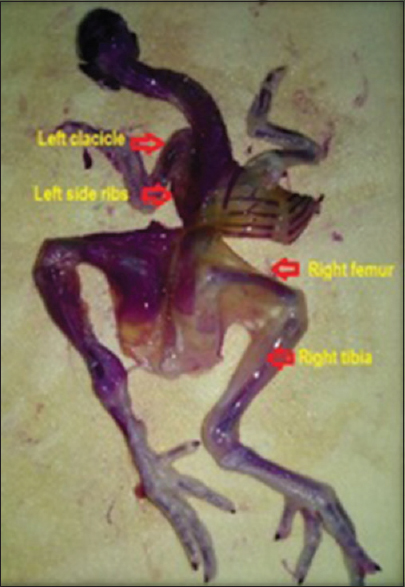 The chick embryos 3.3% from, 23.3% from experimental Group D, 10% from control Group E, and 20% from experimental Group E were found suffering from scanty feathers [Figure 4]. 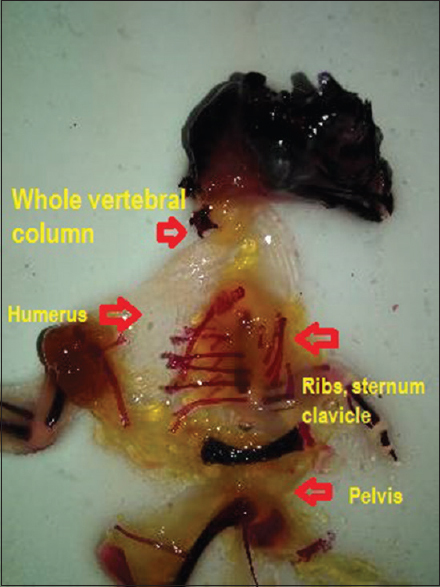 Subcutaneous hemorrhage (hematoma) was found in chick embryos obtained 3.3% from experimental Group C, 10% from experimental Group D, and 33.3% from experimental Group E [Figure 5] and [Figure 6]. Nearly 3.3% chick embryos from experimental Group C, 6.6% from experimental Group D, 6.6% from control Group E, and 26.6% from experimental Group E were found fail to retract of their yolk sacs [Table 4]. The axial and appendicular skeletal abnormalities are given in [Table 5], [Table 6], [Table 7], [Table 8], [Table 9], [Table 10], [Table 11], [Table 12], [Table 13], [Table 14], [Table 15], [Table 16], [Table 17], [Table 18] and [Figure 7], [Figure 8], [Figure 9], [Figure 10], [Figure 11], [Figure 12], [Figure 13], [Figure 14], [Figure 15], [Figure 16], [Figure 17], [Figure 18], [Figure 19]. Teratogenic mechanism covers the series of events that occur from the movement a teratogen exerts its influence on the tissues of developing chick embryos to the final results of malformations either structural or functional. The initial event in teratogenesis may be brought about by a teratogen by its own or by its metabolites and the influence being exerted (a) on an organ primordium which will be malformed later or (b) on the embryonic tissues other than the one going to be malformed, or (c) the maternal tissue or placenta. A review of teratological studies shows that a large number of factors initiate the abnormal development at cellular or subcellular levels such as genetic mutation, chromosomal aberration, mitotic interference, altered nucleic acid integrity or function, lack of precursors, and substrates altered energy sources, enzyme inhibition, fluid osmolytic imbalance, and changed membrane characteristics. Morphogenesis and tissue interaction  may take place between two or more tissues of different properties (heterotype) or between like cells (homotype), and these are concerned as the central control mechanism for differentiation and morphogenesis. Many cytotoxic agents at lower doses inhibit proliferative activity and result in reduced cell number, which play a central role in most malformations and teratogenesis. Sequential events in this process are inhibition of RNA synthesis and reduction of mucopolysaccharides, hydroxyproline, and phospholipid contents in the palatal shelves. Reduced proliferative rates has resulted in a lot of studies with cyclophosphamide, hypervitaminosisA, aminocentesis, and chlorpromazine. Multiple teratological investigations reveal that physical or chemical insult produces cell necrosis in tissues destined to be malformed within a few hours or days. It has found that higher doses cause cell death and teratogenesis and at lower kill the cell at a lower rate but may not produce malformations. There are varied responses to cytotoxic agents from cell to cell. This might be due to many reasons. Most important is intrinsic cell difference which determines whether the cell will die or not. With 6 aminonicotinomide, a severe vacuolation was found in ectodermal cells but not in mesodermal or endodermal derivatives. The sensitivity of the cells depend on the nutritional state, which is carried out by diffusion. Cells farthest from nutritional source are affected most. There are abundant evidences that insecticides produce their acute toxic actions by inhibiting acetylcholinesterase. 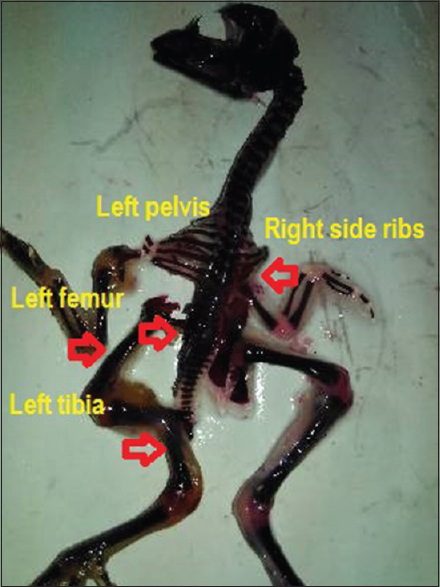 In the present study, α/β arteether in different doses effects embryonic chick development as indicated by the conditions such as lethality rate [Figure 20], growth retardation, and poor ossification of bones. Hence, many defects indicate the probable involvement of more than one biochemical lesion or mode of action. The observation on poor ossification of skeleton could be due to the impairment of chondrochondroitin sulfate, possibly through interference with an NAD-dependent process. The inhibition of yolk sac membrane K-phase activity has been directly correlated with the lowering of the embryo NAD level and teratogenic signs. This may be result of nutritional deficiencies, due to the failure of the embryo to receive some esters-metabolized products from the yolk sac. 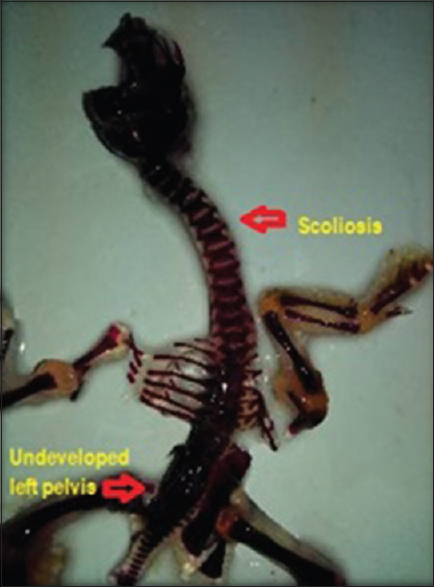 The vertebral defects (lordosis) are attributable to acetylcholinesterase inhibition ,,, and associated disruption of the cholinergic system.,, α/β arteether has a long plasma life and narrow safety range. Therefore, adding the drug halfway through the treatment only add to the adverse effects and not to the therapeutic benefit. It should not misuse the newer antimalarial drug α/β arteether and need to preserve it for future. Research into α/β arteether is scanty and the parasite is fast developing resistance even for α/β arteether. Depletion of α/β arteether by misusing it may have nothing left for treating all drug-resistant malaria in nearly coming future. Therefore, α/β arteether, the drug of choice for the treatment for chloroquine-resistant malaria and life-threatening malaria falciparum should be used only when definitely indicated and not discriminately.α/β arteether should be used only when parasite index or other methods prove drug-resistant malaria. In addition, α/β arteether can be used in cases of hyperparasitemia or life-threatening complications on account of their ability to clear the parasitemia to other antimalarial drugs. Infection with plasmodium falciparum and chloroquine resistant plasmodium vivax is dangerous so effective and safe treatment is required. At present, α/β arteether is drug of choice for the treatment of malaria falciparum and chloroquine resistant malaria vivax because no other drug is available for the same. Due to the unavailability of any other drug and more overdue to insufficient qualified health infrastructure in hugely populated India α/β arteether and other drugs of its group are being using very frequently resultant α/β arteether resistance malaria cases are started to report. The role of α/β arteether is controversial in many previous studies. In a study α/β arteether and other drugs of its group were found embryo-fetal and angiogenesis inhibitor in rats. Using artemisinin combination therapy during the 1st trimester in 685 pregnant Senegal found 2.6% stillbirth, 2.8% miscarriages, and in 1.6% major congenital malformations were identified. 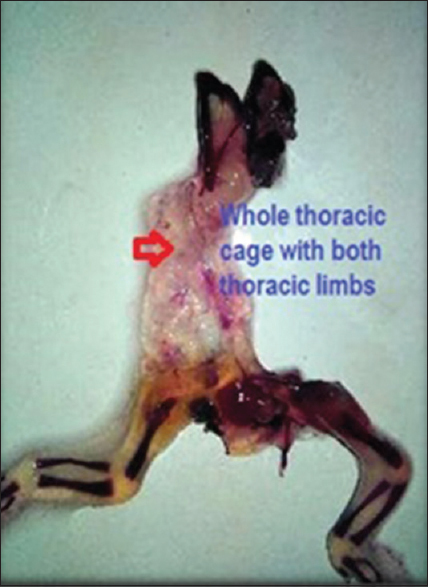 In previous animal experiments, there are clear evidence of death of embryos and some evidence of gross anatomical abnormalities  by using α/β arteether and drugs of its group. There are so many research fellows , who worked on teratogenic effects of α/β arteether and other drugs of its group with respect to pregnancy and concluded toxic in early pregnancy and safe in the 2nd and 3rd trimester but as far as teratogenic effects of higher dose of the same drug is concern the data are very much insufficient almost negligible. 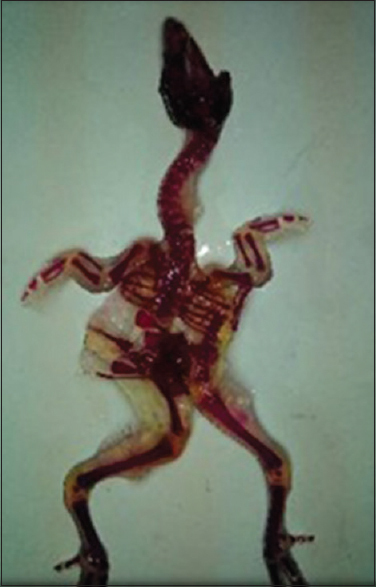 In the present study, the increased mortality and poor ossification of the skeleton in experimental groups are significant and directly or indirectly implies the growth of the embryos. 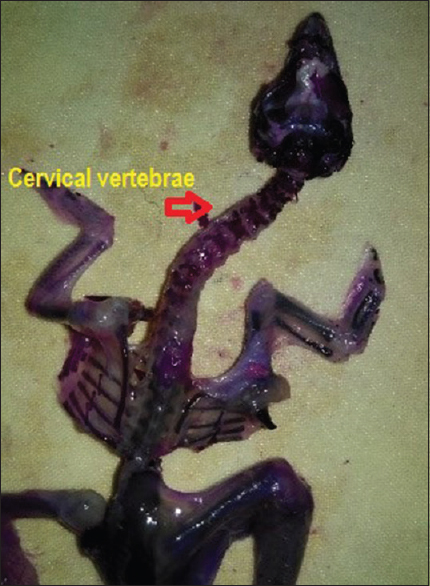 The present study revealed increased mortality percentage, growth retardation, poor ossification and alteration in the curvature of vertebral column, etc., due to effects of the α/β arteether. The drug is toxic, especially when used in a higher dose and for a long period. At present, there is no alternative drug available for the treatment of chloroquine-resistant malaria and malaria falciparum except α/β arteether. Therefore, α/β arteether and other artemisinins should be used only after the establishment of proper diagnosis in recommended dose only not in a higher dose and not for a long duration. Stern CD. The chick embryo – Past, present and future as a model system in developmental biology. Mech Dev 2004;121:1011-3. Kotwani A. Use of chick embryo in screening for teratogenicity. Indian J Physiol Pharmacol 1998;42:189-204. Estimation of True Malaria Burden in India, a Profile of National Institute of Malaria Research; p.91-9. National Vector Born Disease Control Programme. Directorate General of Health Services, Ministry of Health and Family Welfare Government of India; 2014. Natekar PE. 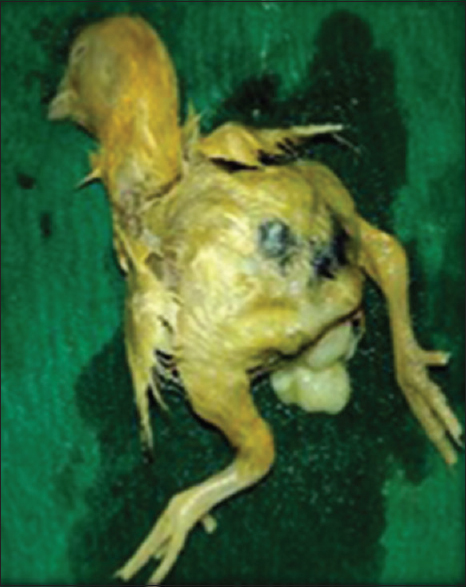 Methotrexate induced gross malformations in chick embryos. J Hum Ecol 2007;21:223-6. 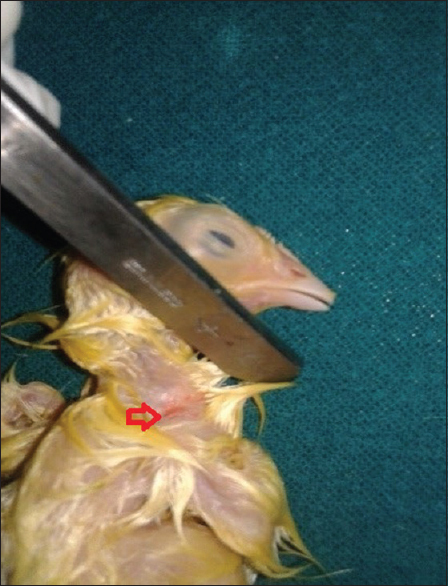 Singroha R, Srivastava SK, Chhikara P. Effect of gentamicin on kidneys in developing chicks. Eur J Anat 2012;16:119-26. Thongphanich S, Roongruangchai J. The Effects of Alphacypermethrin Pesticide on the Development of in Ovo Gallus Domesticus, the 29th National Graduate Research Conference, Mae Fah Luang University, 24-25 October 2013. Hussein M, Singh V, Gupta P, Yadav B, Singh AK. Developmetal and biochemical effects of imidacloprid on developing chick embryos. JASI 2014;22:12. McLeod MJ. Differential staining of cartilage and bone in whole mouse fetuses by alcian blue and alizarin red S. Teratology 1980;22:299-301. Wilson JG. Environmental. In: Wilson JG, Andfraser FC, editors. Hand Book of Teratology, Volume 1: General Principal and Etiology. New York: Plenum Press; 1977. p. 357-85. Grobstein C. Inductive tissue interaction in development. Adv Cancer Res 1956;4:187-236. Moscona AA, Garber BB. Reconstruction of skin from single cell and integumental differentiation in cell aggregates. In: Fleischmajer R, Billingham RE, editors. Epithelial Mesenchymal Interacttions. Baltimore: Williams and Wilkins; 1968. p. 230-43. Shapira Y, Shoshan S. The effect of cortisone on collagen synthesis in the secondary palate of mice. Arch Oral Biol 1972;17:1699-703. Stefanovich V, Gianelly A. Preliminary studies of the lipids of normal and cleft palates of the rat. J Dent Res 1971;50:1360. 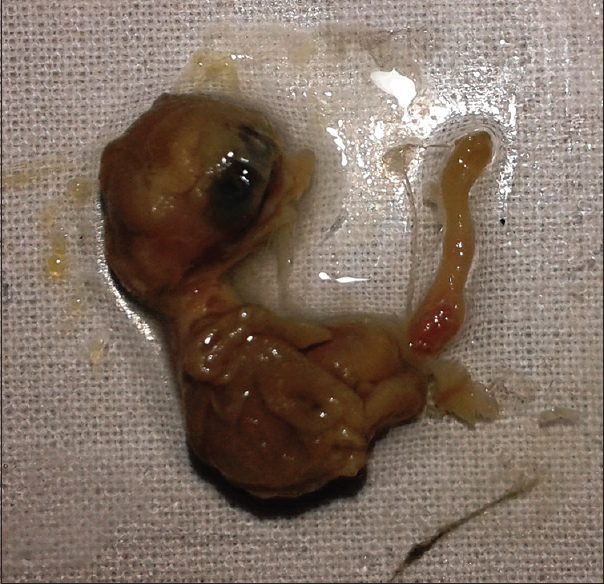 Singh S, Mathur MM, Singh G. Congenital anomalies in rat foetuses induced by amniocentesis. Indian J Med Res 1974;62:394-401. Singh S, Padmanabhan R. Teratogenic effects of chlorpromazine hydrochloride in rat foetuses. Indian J Med Res 1978;67:300-9. Scott WJ. Cell death and reduced proliferation rate In: Wilson J.G., Fraser F.C. (eds) Handbook of Teratology, Vol 2. p 81-98. 1977. Neubert D, Merker HJ, Kohler E, Krowke R, Barrach HJ. Biochemical aspects of teratology. Adv Biosci 1971;6:575-621. Farage-Elawar M, Rowles TK. 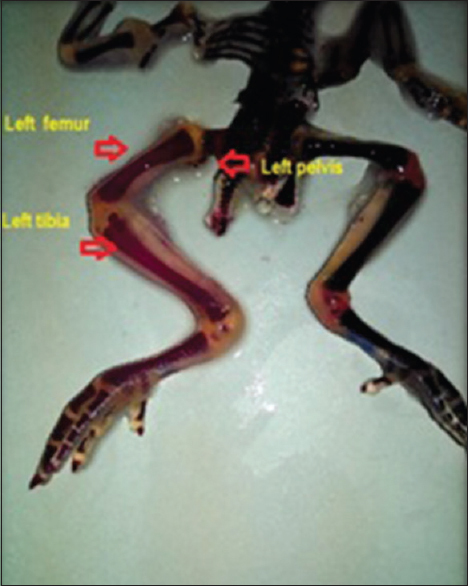 Toxicology of carbaryl and aldicarb on brain and limb cultures of chick embryos. J Appl Toxicol 1992;12:239-44. Overman DO, Seegmiller RE, Runner MN. Coenzyme competition and precursor specificity during teratogenesis induced by 6-aminonicotinamide. Dev Biol 1972;28:573-82. Scifert J, Casida JE. Mechanisms of teratogenesis induced by organophosphorus and methylcarbamate insecticides. Food and Agriculture Organization of the United Nations. 1981;1:219-46. Upshall DG, Roger JC, Casida JE. Biochemical studies on the teratogenic action of bidrin and other neuroactive agents in developing hen eggs. Biochem Pharmacol 1968;17:1529-42. Greenberg J, LaHam QN. 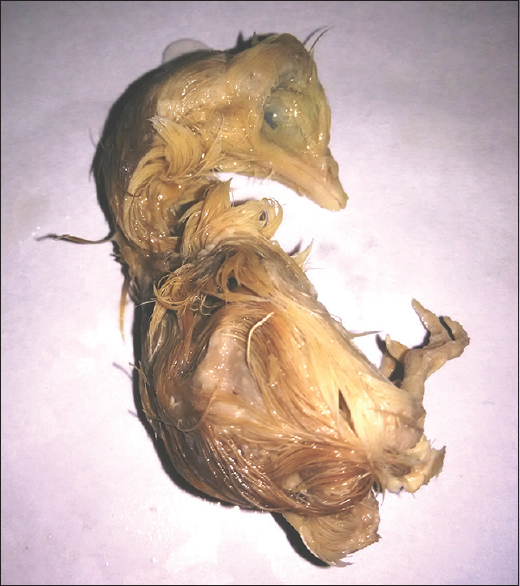 Malathion-induced teratisms in the developing chick. Can J Zool 1969;47:539-42. Khera KS. 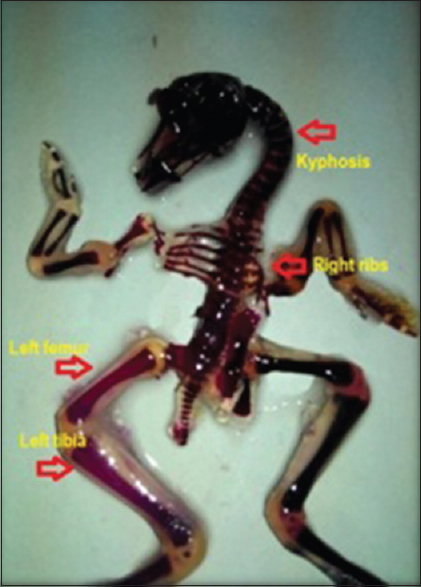 Toxic and teratogenic effects of insecticides in duck and chick embryos. Toxicol Appl Pharmacol 1966;8:345. 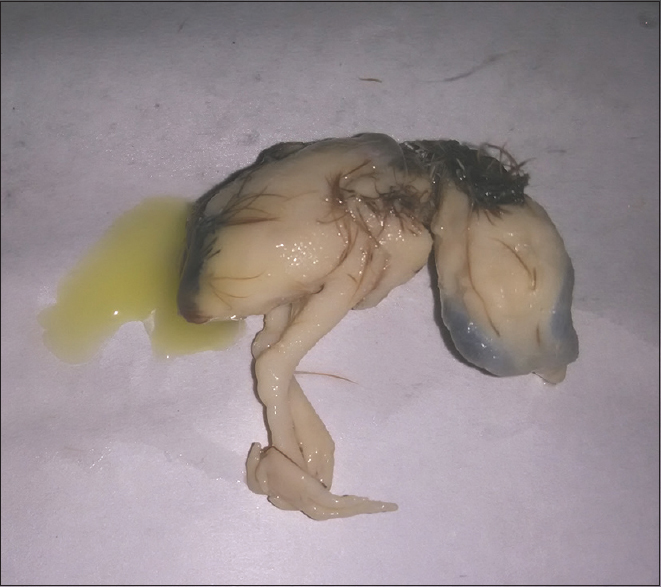 Meiniel R. Cholinesterase activity and expression of axial teratogenesis in quail embryo exposed to organophosphates. C R Acad Sci Hebd Seances Acad Sci D 1977;285:401-4. Walker NE. 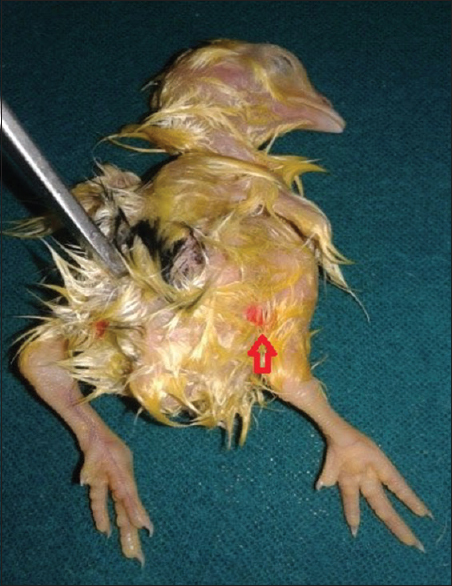 The effect of malathion and malaoxon on esterases and gross development of the chick embryo. Toxicol Appl Pharmacol 1971;19:590-601. Landauer W. Cholinomimetic teratogens: Studies with chicken embryos. Teratology 1975;12:125-45. 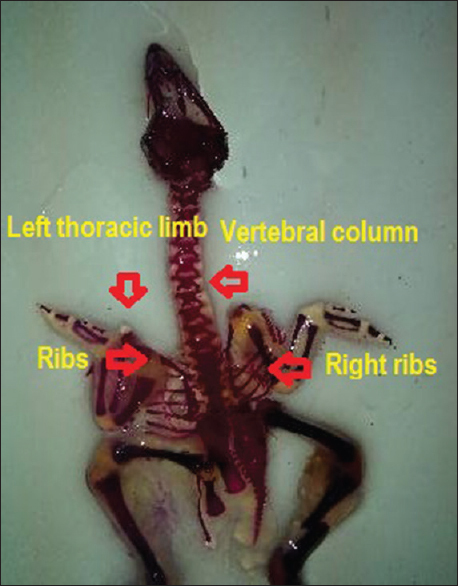 Meiniel R. Neuroactive compounds and vertebral teratogenesis in the bird embryo (author's transl). Experientia 1978;34:394-6. Roger JC, Upshall DG, Casida JE. Structure – Activity and metabolism studies on organophosphate teratogens and their alleviating agents in developing hen eggs with special emphasis on bidrin. Biochem Pharmacol 1969;18:373-92. Li Q, Si Y, Smith KS, Zeng Q, Weina PJ. Embryotoxicity of artesunate in animal species related to drug tissue distribution and toxicokinetic profiles. Birth Defects Res B Dev Reprod Toxicol 2008;83:435-45. Rath B, Jena J, Samal S, Rath B. Reproductive profile of artemisinins in albino rats. Indian J Pharmacol 2010;42:192-3.